I must have rewritten the intro to this post a hundred times in the hopes of not scaring you right off the bat with my peculiar hair washing routine, but what the heck, I’m just going to dive in: I wash my hair with eggs. There. I said it and I love it. I’d like to nerd out (just a little, I promise) on the fascinating science of shampoo and hair to better understand why I chose this method. And just remember, shampoo was only recently invented, like about 60 years ago, and no matter what magical effects they claim, most are basically made of detergents, foaming agents, and pH balancers. pH, and how it relates to hair, is one of the most fundamental aspects of a good shampoo. Each hair strand has a an external cuticle layer that protects it and looks a little like a fish scale armor. When exposed to an alkaline substance, the ‘fish scales’ lift and get ruffled, making hair more frizzy, dull, and tangled. Acids on the other hand, tame the scales by flattening them out, giving hair a more shiny and smooth appearance, while providing a stronger armor to protect it and help it retain moisture. It’s not surprising that many of those who have tried going no (sham)poo have at some point had a major homemade hair washing fail or have given it up all together. Your scalp and hair favor a more acidic environment, so exposure to anything that upsets their delicate pH balance will cause your hair to rebel, and your scalp to flake. Not a pretty site. Trust me, in my quest for the ultimate no ‘poo alternative I have tried everything from the classic baking soda and vinegar routine, clays, bean/wheat flours, herbal teas, soap nuts, homemade soaps, and various other concoctions. Most of them were major fails, though to be honest, I stuck with the baking soda and apple cider vinegar method a good 3-4 years because I actually quite liked it once I found the right proportions that worked for me. The reason I experimented with other stuff was mostly due to pure curiosity, but also because all of these alternatives were just not very practical. Until one day I tried washing my hair with eggs.. I stumbled upon this ‘peculiar’ method while reading about how people used to wash their hair with eggs before shampoo was invented. Intrigued, I gave it a try and have been totally hooked ever since! My hair is normally thin, wavy, and prone to getting greasy quite quickly, but even in comparison to miracle-promising brands, egg shampoo gives my hair a clean, shiny, and volume-rich boost that I’ve never had before. In fact, I love egg recipes so much, that I also make my fabulous mascara out of them. 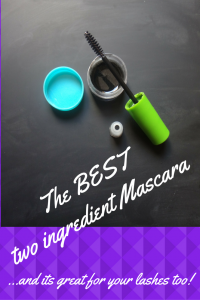 So after you read this, be sure to check out my my post for a super easy and lash-boosting Two Ingredient Mascara. Eggs clean hair through the process of emulsification. This means that thanks to a substance called lecithin, the egg yolk combines with water and oils (from your greasy hair) so that when rinsed, it all simply washes out, leaving only perfectly cleaned and pH balanced hair. Eggs have a pH level that is naturally similar to the kind that our hair and skin prefer. That’s also why there’s no need for a conditioner or acidic rinse afterwards. The slightly acidic pH of this one product alone makes our hair shiny and our scalp free of dandruff. Eggs are packed (especially the yolks) with vitamins, minerals, and protein. 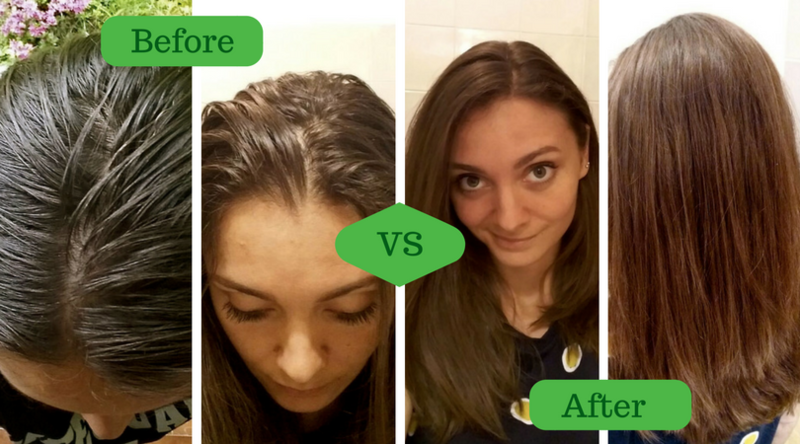 Many people make egg masks for their hair exactly because they know, and see, the benefits of using this awesome nutrient boost. Basically, the magical yolk is very effective at removing excess oils and dirt without the use of harsh chemicals. It does so without drying your scalp and hair so that your body doesn’t freak out and produce oils in overdrive to compensate (like I describe in this post). No need for conditioner either since yolks are packed with nutritive substances and pH balancers of their own. For me, this has translated into only having to wash my hair every 5 days or so, whereas with regular shampoo I’d have to wash every other day! Here are some before and after images. I let my hair get extra greasy for picture effect (please don’t judge me). 1. Crack one egg and separate out the yolk into a small container (like a jelly or baby food jar) and try to eliminate any of the stringy white stuff. It may not sound like one egg yolk is enough, but I have long-ish hair as you can see in the pictures) and that is all I need. 2. There are then 2 ways of preparing for its use: the classic, messier way (2A), and the more practical way I discovered and love (2B). 2A. 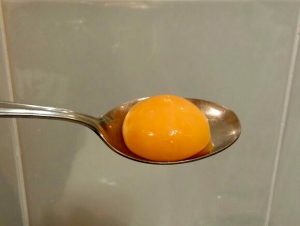 Take the fresh yolk in the shower with you and once your hair is fully wet, poke the yolk in the jar with your finger so that it turns into a nice creamy product. This is where you’ll develop your personalized method, but your goal is to just apply it to the base of your hair (hair closest to your scalp). I pour out about a spoon full into my other cupped hand and apply it with a sort of sweeping gesture to spread it in rows from the front of my head to the back. 2B. Freeze the yolk and about 30 min-1h before showering take it out to thaw. You’ll notice that once thawed, the egg yolk remains solid. Just like you can’t uncook an egg, you can’t un-solidify a thawed yolk (have I mentioned I love science?!). Now you’re left with a somewhat putty-like and manageable yellow ball that you can pick up and take in the shower- no need for a container. Once your hair is fully wet, take this yellow ‘ball’ and either pinch off little chunks or directly apply it on the base of your hair (hair closest to your scalp). You’ll develop your own method, but I apply it in sweeping motions, as if drawing rows on my head from front to back with a crayon. I usually start on one side closest to my ear, and sweep the yolk in rows to try to spread it all out. No matter the the preparation method you choose, it’s ok if you feel like you haven’t perfectly spread it out, because now you will take a few moments to massage your scalp and spread it all around. Massaging will not only remove excess oils and grime, but it will also feel wonderful. Once you feel like you have massaged all your scalp thoroughly well, you can either let it sit a bit to get more of a nutritional mask benefit or you can proceed with rinsing in the next step. 3. While rinsing continue to massage your scalp to ensure everything is washed out. There’s no need to apply any of the yolk to the rest of your hair because it still flows through through it during the rinsing process. You’ll notice right away that it already feels clean yet moisturized. There’s also no need for conditioner because the egg acts as a cleanser and conditioner all in one! Your hair is too dry, it means that the yolk has perhaps somehow worked too well. Add about a tablespoon of honey, or even yoghurt, to the egg so that it provides even more moisture. Your hair has turned out too greasy, which can be due to 2 things: either one egg yolk is not enough for you, so you may have to use 2 next time, or you have washed your hair with egg yolks a few times now and the high levels of protein in it have built up. For some people, the protein will build up and appear greasy. This is easily fixed by using another hair washing method every so often. This happens to me about once every month or so, and I remedy it with a baking soda and vinegar wash.
You notice an egg smell even after you have washed it out. Personally, I have never had this happen to me, even though I have hard water which should in theory make it more possible. In this case, make sure you are rinsing your hair well with plenty of water, and if it persists, you can follow the egg wash with a scented tea rinse (like chamomile or rosemary) or a cup of water with your favorite essential oil scents. You followed this wash with a vinegar rinse, and you notice the egg smell afterwards. My suggestion is to not use a vinegar rinse. I have tried this too, since it’s basically been routine for me to do so, but I’m not sure why, doing this releases a slight egg smell. It will not cook into your hair. One of my guilty pleasures is a nice hot shower, but unless your water is boiling, which it shouldn’t be because it’s not healthy anyway, this shouldn’t be a problem. If you are skeptical, try using slightly less hot water during the rinsing phase. You’ll see it’s fine. I think where some people may have had a problem is if using the whole egg (not just the yolk)- there’s something about using the egg white that makes is slightly more cookable. You will not smell like egg. If for some reason you do, refer to the third troubleshooting point. This has not been the case for myself or other regular egg shampooers. 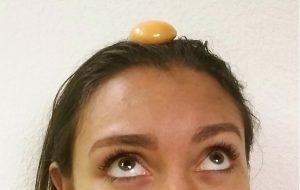 See if you can try different things, like perhaps using fresher eggs, spending more time rinsing your hair after washing, etc..
You will only rarely have a little egg piece in your hair afterwards. You know those pesky white stringy things that sometimes stick to the yolk? Well, if you don’t do a thorough job of removing them before using, sometimes they can remain in your hair after washing. If it happens, it’s usually just one visible little white piece that’s easily removed. My biggest one is using the frozen egg yolk method described above in step 2B. This is because the solidified yolk becomes perfectly manageable just like any other hair cream/mask so that you don’t have to deal with the messy liquid stuff and extra containers. Plus, you can freeze as many as you want beforehand and let them even thaw in the shower while you do other stuff. 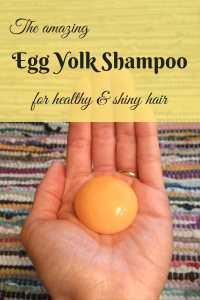 Since yolks have lots of protein that can lead to buildup (as mentioned in the troubleshooting section), about once every month I wash my hair with baking soda and apple cider vinegar to remove any excess. This is what works for me, but feel free to use any other method or shampoo you prefer. Hi Sharon, is your hair usually dry? I have only read about the possibility of egg yolks being too drying, but I haven’t actually heard of it happening to anyone yet. However, yolks are potentially drying due to their ability to bind to, and wash away oils. Proteins, on the other hand, can fill in gaps in damaged or porous hair, as well as lightly coat the shaft to ‘strengthen’ it. This is where the coating could build up and cause more stiffness, leading to breakage over time. From the research I have done, just washing and rinsing hair with eggs should not be enough to cause too much protein buildup to break hair. And like you said, a BS and ACV should do just the trick to remove protein buildup and completely cleanse your hair every so often. I say give it a try and see what happens- we could go from there 🙂 One wash will not have any extreme effects on your hair quality. Let me know how it goes! I have bleached blonde hair, so guess the reason why I was so desperate to find something natural that would make me feel Good about my dry and damaged hair. Well… I didn’t experiment much, first I tried honey-water mix as a shampoo, but it didn’t work well. Then heard about egg yolks and here I am. Used 2 egg yolks and oh my God! I had instant effect of soft and silky hair. Kept washing every 4th day or so and well… I’m glad that finally found this unique method. Good for health, environment and purse. 😉 🙂 Also, thanks for this amazing and informative article. i think the the bad egg smell can only happen when you don’t completely separate the egg white from the yolk,i found that the best way to make sure that there’s no white, is to leave the yolk after separation, in the air for like 30 minutes or so. then it will form a very thin coat, once you touch the yolk very softly you will break this cought, you can then pour the yolk out of this coat into another container,as the coat will be slightly glued to the plate. this is also a way to make sure that you won’t have white strands in your hair. and by the way, i used to make a hair mask of one egg yolk,a spoon of honey and three spoons of olive oil. i left it on my hair for an hour then washed it normally.i used this method for less than a year. the thing is, this really changed my hair 180°! i used to have a completely dry hair, now i have oily hair😂😂 i even stopped using it, i think it worked way too good😂 but for people with dry hair, definitely try this. oh i think i used shea butter conditioner at the same time so that also helps. Hi Neko, these are great tips, thank you so much! I enjoy learning new things from the comments, and this is a great one 🙂 I’ll definitely try letting the yolk dry a little to separate it from the white part, and let you know when I try the conditioner you suggest!